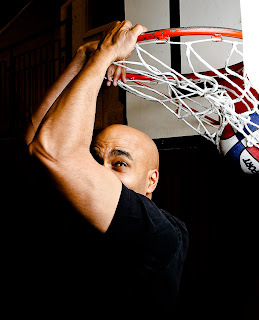 I’ve played basketball with numerous celebrities, including George Clooney in Washington, DC and R. Kelley twice - in the nation’s capital and New York City. It was obvious both superstars loved basketball and for the most part, enjoyed the games without incident, outside of a few irritating players who were star struck and/or trying too hard to impress. The third celebrity I played with was Diddy (former Puff Daddy). What surprised me about watching him at the Reebok Sports Club in NYC, were the lessons learned. The intensity and fierceness he displayed on the court was unexpected. I guess I shouldn’t have been so surprised since he’s been so successful although that type of intensity is rare to see on a court of amateurs. While I don't recall how well he played that day, I do remember the way he played. While on the court, he was serious and relentless, expecting the same from those around him. There was no doubt about his focus and desire to win. Those types of traits have obviously served him well in business. When he wasn’t on the court, he was on the phone 100% of the time. When I played on his team, he kept telling the other 3 guys, “get the ball to him (meaning me)”, as I was the best shooter and a former Division 1 college player. The aforementioned 3 worked for Diddy and kept trying to pass him the ball for whatever reason. He wanted none of it and only cared about winning, thus the intention to put the ball in my hands. A comical moment was seeing a few good players totally lose their composure around the entertainment mogul. Occasionally, he would drive down the lane and some would intentionally move out of the way. Maybe the hype about his gangster reputation flowed into their mind. I never thought I would see quality players become so flustered or frightened around a celebrity. After the game, I rode the elevator down with Diddy and his security team. We had a quick chat and he couldn’t have been more gracious. What I didn’t tell him was what I learned about him that day. It was something I’ll never forget.